Institutional Review Blog: Why is Felice Levine satisfied? Inside Higher Ed reports that Felice J. Levine, executive director of the American Educational Research Association, is happy with the final rule. I’m curious about why; it doesn’t seem to give her anything she asked for in 2011. Early reactions from social science groups to the changes in the common rule were positive. Various provisions suggest that institutional review boards, which must review proposals to study humans, work to understand the needs of different kinds of researchers, and that there are different levels of risk associated with taking an experimental drug and answering confidential survey questions. For anthropology, the reaction was more mixed. Anthropologists pushed hard for specific mention of “participant observation” (a key tool of their discipline). The hope is that mention of this methodology will make it easier for institutional review boards to approve projects involving this approach. 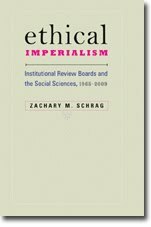 Sometimes in the past, [Edward Liebow of the American Anthropological Association] said, IRB members or others have not understood that the relationship between an anthropologist engaged in participant observation isn’t the same as a scholar who is interviewing his or her research subjects. But he said that his association was “especially concerned” that the final version of the rule did not exempt participant observation, as his organization had urged. I can understand Liebow’s disappointment; the final rule offers little aid to frustrated ethnographers. The White Paper objected to the current §46.116(a)(2) requirement that informed consent include a “description of any reasonably foreseeable risks or discomforts to the subject,” suggesting that “reasonably foreseeable harms” might better apply. The final rule does not make that change. The White Paper objected to the current rule’s “general mandate to apprise subjects as part of the informed consent process of alternatives to treatment or why it may be in their best interest not to participate. (Such requirements are sometimes appropriate, but add complexity and foster confusion where they are not. )” The final rule maintains the current rule’s language on this point. The White Paper “strongly support[ed] the requirement of an appeals process.” This was not included in the NPRM or final rule. The White Paper argued that “it should be incumbent on the reviewer to state specifically in writing what aspect of a registration document leads to doubt a project’s excused status and to refrain from review where it finds none.” The final rule [§__.115(a)(3)] takes a small step in requiring documentation of “the rationale for conducting continuing review of research that otherwise would not require continuing review,” but it does not require such a rationale for denying an exemption. The final rule, with its announcement, is 543 pages long in its initial format, so perhaps it includes some of the White Paper’s recommendations that I have overlooked. It’s also possible that Levine is thinking primarily of the final rule’s provisions for research “involving normal educational practices,” which I have not examined so closely. But the new rule seems to make this research harder; to win exemption, research must be “not likely to adversely impact students’ opportunity to learn required educational content or the assessment of educators who provide instruction,” something not required by the current regulations. So far, I can’t see why Levine is calling this a win.